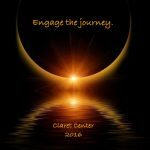 We chose a theme for our year: Engage the Journey. Several staff wrote a summary of what this theme means to them at this time in our work together. Our theme “Engaging the journey” suggests a dynamism that needs to exist within the group which is now in a significant phase of transition. I believe that the theme involves the call for us to live deeply which translates for me into a commitment to relate differently with each other. We need to be honest about how we experience the group and how we relate to each other. The Board of Directors along with the Executive Director and the Claretians Community are the decision makers for Claret Center. Engaging the journey means for me that we are engaged by them so that we are active participants in the future of Claret Center. One example of this would be to be consulted on matters that pertain to how money is spent. Engaging the journey also means for me that we are aware of and respond to the urgent need in the world today for us to live intentionally out of evolutionary consciousness. This involves a commitment to let ourselves evolve into higher and higher consciousness which is love. I think it is Richard Rohr who advises us to see all people in their essence – as pure Love at their core. In every moment life is a journey. My challenge is to be present to and let go what is passing, and to invest fully in what is coming to be. Old ways need to die to make way for new ways of being. At Claret we are committed to being companions on the journey of those who come to walk with us. We are also increasingly attuned to the vitality of growth at the Center, in terms of what we offer and how we make it available. We are currently choosing to engage with each other during this time of transition, as we let go what has been, and discover and create ever more vibrant ways of evolving together. Engage the Journey The simple phrase carries a wealth of possibility. I like the acknowledgement that it is a journey not a destination that motivates so much of what we do and are at Claret. The word engage calls for a response from us. The journey is on-going with or without us. Engagement pulls us into that ongoing movement. How we engage is our decision. A very strong spiritual presence exists at Claret that I experience as the core of Claret’s identity. Also, a number of different approaches exist, in parallel, with varying degrees of emphasis on the mind-body connection. All have a common goal of healing, but the center misses out on the potential richness in depth, because the approaches are not integrated. I believe approaches within the center can be integrated, using spirituality as the superordinate, unifying framework. One form of integration might involve combining the two trainings into one training with two tracks–” both-and” approach. The primary message in our mission statement is to provide resources to journey. Whose journey? It can be our clients’ and ours, staff members’. Then what is it? Though it depends on how we interpret the word journey, it seems to me that a commercial message may be a great help to clarify our mind. It goes: “A journey is not a trip. It is not a vacation. It is a process. A discovery. It is a process of self-discovery. A journey brings us face to face with ourselves. This kind of journey is the one what I have been doing since I started to work at Claret Center as acupuncturist. I walk with each client suffering from pains; arthritis , diabetes, cancer, injury, It is a process of questioning where the pains come from, i.e. life style, diets, social relationship, life conditions like stress,etc. ,and also a process of finding ways to deal with them. What can they do about it? It is a process of discovery. It is a process of self-discovery. The important thing is not just eliminate pains, but engage the process with clients together so that we can prevent them. I have been doing this kind of journey with my clients in different activities. and manageable healing for Mexican communities as well as domestic violence women’s meeting at St. Pious. Certainly I believe that our vision and goals must be directed toward the future based on the needs of the present. I also believe that there must be a healthy development in continuity with our past history and experience. Personally I see my purpose to remain at Claret as being a resource and reminder our our history and experiences as a jumping off point to new enterprises that are in keeping with our genuine spirit, and offering personal assistance which because of my special condition I am able to offer to some people who seek our help at the Center.